What is the one thing almost everyone has on their desk? I would think a mouse pad is almost universal followed closely by a memo pad and a calendar. What if you could send your clients all three in one package? The answer is the Note Paper Calendar Mouse Pad. One supplier that I have located is called Digispec which specializes in mouse pads. In fact their slogan which is great is “Mouse pads are all we make!” Couldn’t get much simpler than that. Quite simply this is a 12 month calendar that also serves as a mouse pad and a memo pad. The 28 themes they provide would work for almost any industry. There is a 2¼”x5½” area on each page for your color marketing message. 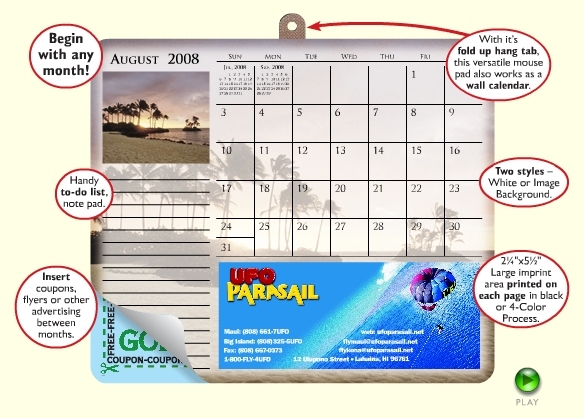 You can choose to have just a picture in the top left corner with a white background behind the calendar or you can have the image as part of the background. You can start the calendar at any month. You can even insert coupons and other marketing tools between the pages. If they already have a mouse pad they can’t bear to part with, they can either use it as a desk jotter pad or hang it on the wall with the fold-up hang tab. This is the kind of giveaway that I think people will not only appreciate, but will be in front of them for the next 12 months reinforcing your brand, product and/or service. And they will want a new one every year. It is a cost-effective promotion with the unit price for 250 pads being about $ 4.50 including set-up charges. If you add 6 additional pages between the calendar pages the cost is only about $ 0.25 per calendar. What a great way to include marketing information or seasonal specials. If you are interested in more information you can call the company directly or call me, Mike Blaney at 800-568-8338. We can lay out your ad and take care of all of the ordering for you. Great idea.. I think about this sort of stuff a lot. The things that everyone needs.